India augmented its naval strike capabilities by inducting the indigenously developed nuclear submarine Arihant. Indian Army's artillery firepower was boosted by the purchase of M777 Howitzers from US. The Narendra Modi-led government had in 2015 agreed to go in for 36 Rafales in a direct deal with France, and by the end of 2016 Indian defence was able to test the inter-continental nuclear capable missile Agni V. India augmented its naval strike capabilities by inducting the indigenously developed nuclear submarine Arihant. Indian Army's artillery firepower was boosted by the purchase of M777 Howitzers from US. Even though the Defence Ministry was not directly involved, investigating agencies carried out raids against a number of defence middlemen while cases were registered against some staying abroad in connection with alleged corruption. Another big development that came towards the end of 2016 was the successful fourth test of the indigenously developed inter-continental nuclear capable missile Agni V that has a range to cover entire China. The missile is now ready for user trials and eventual induction into the Strategic Forces Command. The file for a medium multi-role combat aircraft (MMRCA) was first moved in 2000. The Narendra Modi-led government had in 2015 agreed to go in for 36 Rafales in a direct deal with France while terminating the original tender for 126 MMRCA. The aircraft, equipped with latest weapons including the 150 KM range beyond visual range missile 'Meteor', can even carry nuclear bombs, will add to the strategic assets of the country. Another big move was the induction of the indigenously developed nuclear submarine Arihant. The government has still not officially announced the induction. The understanding between India and Russia to lease a second nuclear sub marine was another important strategic move. The terms and conditions are still being worked out. The Inter-Governmental Agreement on the purchase of S400 Triumf air defence system is also a big development eventhough the nitty gritty are yet to be worked out. The decision to finally induct the indigenous Light Combat Aircraft Tejas was also a big move. India and Russia restarted talks on the fifth generation fighter aircraft programme after a hiatus of about a year. The contract for the purchase of M777 light weight how itzers was also welcomed by the army which will deploy mostof them along the borders with China. 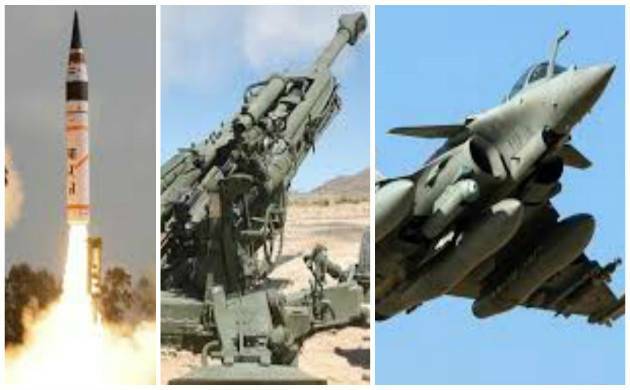 The M777 was the first artillery deal cleared by the Indian government since the Bofors scandal of late 1980s. To ensure better deployment of these guns, the ministry also struck a deal for 15 heavy lift Chinook helicopters. Giving the IAF yet another fillip to its strength, 2016 saw signing of a deal with the US for 22 Apache attack helicopters. The signing of the much-debated logistics agreement withthe US was also an important development. The UPA government had refused to sign it but Parrikarwent along after the US rewrote the agreement as per India'sconditions.